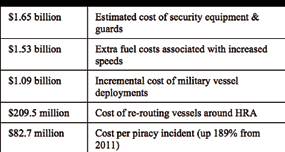 The havoc caused by modern-day piracy continues to inflict a very high cost on the global economy. Reports by the World Bank and the Oceans Beyond Piracy project agree that one of the most effect means of reducing piracy has been the increased and continuing mobilization of international naval forces and tighter security adopted by the shipping industry. The “big three” of naval counter-piracy operations include EUNAFOR’s Operation Atalanta, NATO’s Operation Ocean Shield, and the Combined Task Force 151 (CMF-151). CMF-151 is a multi-naval task force established in 2009 and they conduct operations under a mission-based mandate of the Combined Military Forces (CMF). The task force’s goal is geared toward deterrence, disruption, and suppression of piracy off the coast of Somalia and in the Gulf of Aden. A key to the success of the naval coalition efforts is the ability for all members of the multinational task force to communicate effectively and efficiently despite differences in data network specifications. 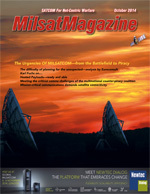 To achieve the level of communication and cooperation necessary for the CMF to execute effective strategies against piracy, terrorism, and other criminal activities, coalition forces required a common satellite communications system that could deliver high-performance at low cost, handle heavy data flow, and was easy to deploy on multiple vessels. The CMF found a solution that meets all of these requirements in the mini-VSAT BroadbandSM global satellite service network from KVH Industries, Inc.
KVH today offers a series of onboard terminals for the mini-VSAT Broadband service, from the compact TracPhone V3-IP with a 37cm antenna, to the TracPhone V7-IP with a 60cm antenna, up to the global dual-mode C/Ku-band TracPhone V11-IP with a 1m antenna. The preferred system for the CMF was the enterprise class TracPhone V7 (the predecessor to the TracPhone V7-IP) with a 60cm antenna. All TracPhone V/V-IP series terminals are one antenna, total end-to-end solutions, featuring integrated, below decks equipment and the antenna is pre-configured for the global mini-VSAT Broadband service, built on the foundation of ViaSat’s ArcLight® spread spectrum technology. 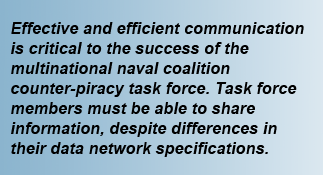 When assuming command of the CMF and its task forces, Navy commanders discovered that some coalition partners were deploying vessels into the region that did not have adequate datacom messaging capabilities, leaving them unable to communicate with other task force vessels. CMT operations require the use of the Combined Enterprise Regional Information Exchange System (CENTRIXS), which is often encrypted and enables ship-to-ship operational dialogue between vessels of other nations in text and web-based formats. CENTRIXS, which consumes a high volume of data, is vital to the success of the operations. As the task forces operate in a widely dispersed fashion, line-of-sight communications do not meet daily needs. Additionally, when multiple nations speak English with varying dialects, ensuring that all parties have the same level of understanding can be difficult. CENTRIXS enables the secure use of such widely used tools as chat/instant messaging and email, as it is easier to reach understanding with written communications. Initially, CMF provided various coalition vessels a provider’s L-band systems, which were desirable based on their small antennas, straightforward configuration, and coverage throughout the operational region. Unfortunately, the steep cost of data transmissions as well as high latency, combined with the high data volume required by CENTRIXS, resulted in prohibitively high SATCOM costs. Furthermore, the forces in the operations are constantly changing. Various countries assign vessels, aircraft and personnel to the task force operations. Therefore, the Navy felt there was a need to offer SATCOM systems that were simple to install and operate, as well as being able to deliver global coverage with reliable high-performance at a lower cost. KVH Industries’ TracPhone V7 with the mini-VSAT Broadband network presented the solution to these multiple challenges of performance, affordability, and ease of installation and operation. Coalition forces drew on the extensive testing, evaluations, and operational experience of the U.S. Coast Guard in selecting the TracPhone V7 and mini-VSAT Broadband solution. The Coast Guard was faced with meeting the challenge of many new applications that required or would be enhanced by broadband connectivity, as well as the need to provide Internet and voice calling capabilities for their crew members while offshore. With that in mind, the USCG began testing KVH’s integrated SATCOM system shortly after the service was launched in September of 2007. 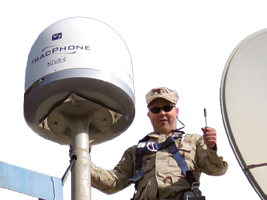 The flexibility and power of the TracPhone V7 and mini-VSAT Broadband service are clearly demonstrated by the system’s ability to meet the USCG’s rapidly expanding requirements driven by new biometric technology used in immigration and law enforcement activities, missions that sent USCG vessels to the Persian Gulf in support of the U.S. war on terrorism and anti-piracy efforts and natural disasters that required the USCG to support humanitarian efforts. In addition, the 24/7 nature of USCG operations and the extreme sea and weather conditions in which these relatively small vessels operate demanded the durability and reliability of the TracPhone V7 and mini-VSAT Broadband service. The USCG began deploying KVH’s TracPhone V7 systems on their 225-foot Seagoing Buoy Tenders and their 240-foot Seagoing Buoy Tender/Icebreakers to replace the previously-installed equipment, which was proving to be prohibitively expensive for the USCG’s expanding broadband requirements. Their primary interest was providing broadband connections for non-classified operations and to improve crew morale. During the Buoy Tender fleet rollout, the Coast Guard inquired about an urgent requirement to augment broadband communications aboard their 110-foot Island Class Patrol Boats stationed in the Persian Gulf. 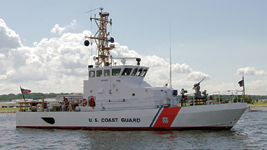 The previous provider was unable to support the concentration of users operating within such a limited geographic area, so the Coast Guard needed an alternative commercial satellite service to meet the communications needs of the Coast Guard vessels operating in the Middle East. KVH provided the TracPhone V7 units and helped the USCG to integrate the mini-VSAT Broadband network into its communications backbone. Coalition operations, such as the successful boarding and seizure operation that freed the M/V Magellan Star from pirates, rely on clear and non-ambiguous communication. Recognizing the significant benefits offered by the TracPhone V7 and the mini-VSAT Broadband service, the U.S. Coast Guard next looked to equip their High Tempo/High Maintenance (HTHM) 110-foot Island Class Patrol Boat fleet with mini-VSAT Broadband service. These vessels use new biometric instruments to positively identify every person the Coast Guard detains, requiring large amounts of data to be transmitted between the Patrol Boats and the central database in Virginia. Using the previous service, this was an extremely time-consuming and expensive exercise, slowing vessel response times. The TracPhone V7 systems deployed on these vessels offered a dramatic improvement in performance, including tracking in rough seas and maintaining communications in rain and other adverse weather conditions. In late 2010, the Coast Guard awarded KVH a $42 million contract to replace the satellite communications equipment on more than 200 vessels with the TracPhone V7 and mini-VSAT Broadband service. The TracPhone V7 SATCOM system is installed on multiple USCG PSUs that are deployed in the Arabian Gulf to assist with guarding high-value O&G platforms. Following assignments to the Combined Maritime Forces, the U.S. Navy purchased six TracPhone V7 units with mini-VSAT Broadband service based, in part, on the success of the USCG’s mini-VSAT Broadband testing and deployment. The U.S. Navy also encourages allied forces working in the combined joint task force in the region to equip their vessels with the mini-VSAT Broadband service. Today, TracPhone V7/V7-IP systems are installed on high-value oil and gas terminals in the Arabian Gulf, and on U.S. Navy and coalition vessels participating in the Combined Maritime Forces. The units are available to be deployed as needed in the Gulf of Aden, the Gulf of Oman, and the Arabian Gulf. These systems have already been successfully deployed on vessels of the navies of Thailand, Pakistan and Bahrain, among others. Based upon their experiences with the coalition, the Republic of Korea Navy, which recently assumed command of CTF-151, purchased three of KVH’s TracPhone V7 systems for installation on their vessels serving in the CMF task forces. The end-to-end solution offered by KVH’s TracPhone V7/V7-IP and mini-VSAT Broadband service meet each one of these needs. 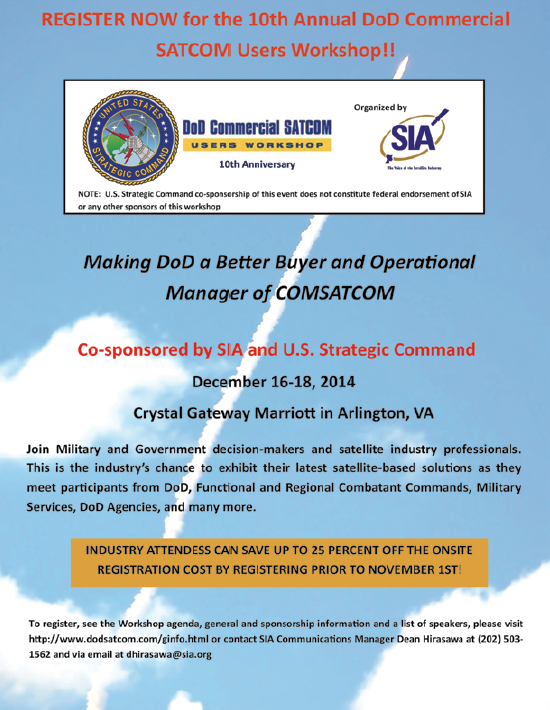 Military forces using VSAT services travel all over the globe, switching from one regional network to another. The mini-VSAT Broadband service is a robust, high-capacity, global broadband network. Numerous Ku-band satellite transponders create seamless coverage throughout the northern hemisphere, and around all of the major continents in the southern hemisphere. In Q3 2012, three global C-band transponders were added to provide total coverage outside of the extreme polar regions. 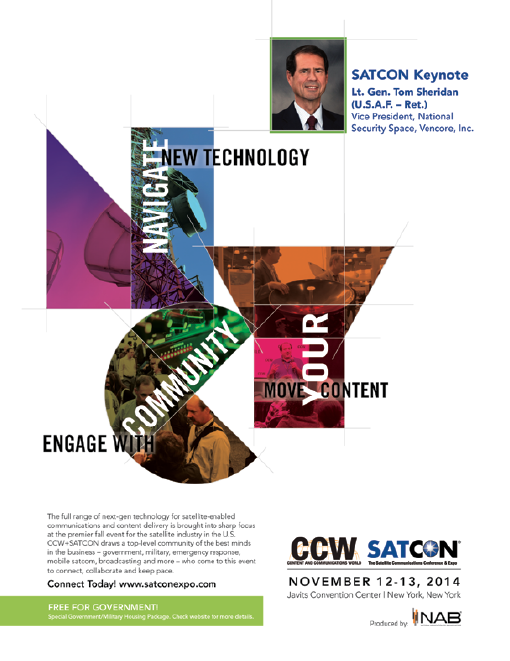 The mini-VSAT Broadband network is the first nexgen maritime SATCOM solution. The global spread spectrum satellite network, built with ViaSat’s patented ArcLight technology, offers more affordable airtime, voice service and Internet access as fast as 1Mbps (ship to shore) and 2Mbps (shore to ship). The mini-VSAT Broadband network is based on ViaSat’s ArcLight Code Reuse Multiple Access (CRMA) spread spectrum technology. The ArcLight technology is more than twice as efficient as older second generation Time Division Multiple Access (TDMA) technology used by all other maritime VSAT systems. The CRMA spread spectrum signals can also be received by much smaller antennas while still ensuring high quality connections that withstand atmospheric interference, rain fade, and multipath errors. In addition, mini-VSAT Broadband’s transmission technology is highly efficient at managing network traffic and provides affordable, consistent data rates. This ensures that vessel commanders and crews get what they need with regard to service speeds, reliability, clear Voice over Internet Protocol (VoIP) phone connections, and performance. The modern spread spectrum broadcast technology used by mini-VSAT Broadband permits the service to operate using smaller antennas such as the TracPhone V7/V7-IP antenna, which is 85 percent smaller by volume and 75 percent lighter than those employed in 1 meter VSAT equipment. By way of comparison, the TracPhone V7/V7-IP is only 24 inches (60cm) in diameter and weighs 60lbs (27kg) compared to the 40 inches (1m) or larger traditional VSAT antennas that weigh 250 to 400 lbs (115-180kg). 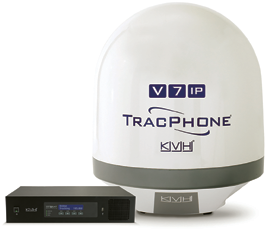 KVH’s TracPhone V7/V7-IP with mini-VSAT Broadband service offers a wide range of affordable, flexible airtime plans, including always-on, fixed-price monthly options and per-megabyte plans that allow TracPhone V7/V7-IP customers to save 85 percent or more per megabyte than existing maritime data services. Reliable, high-quality SATCOM is critical to successful multinational security operations, especially when coordinating multilateral military strategy. The effective deployment of coalition forces requires communications systems capable of supporting high-volume data use, such as Internet access and onboard video teleconferencing. KVH’s mini-VSAT Broadband network and TracPhone V/V-IP series systems have proven themselves ideally suited for such operations thanks to compact antennas, affordable broadband service and global coverage. More than 4,000 TracPhone V/V-IP series systems have been shipped since the product’s introduction, making the mini-VSAT Broadband network the fastest growing maritime VSAT solution. 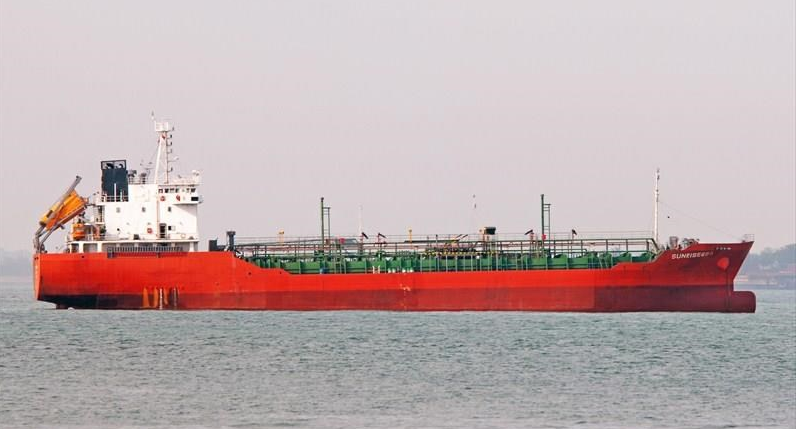 As reported by the Taipei Times, a Vietnam-flagged tanker was hijacked by gun-toting pirates who stole part of the vessel’s cargo of oil before releasing the ship and its crew safely, a Vietnamese official has said. The MT Sunrise 689 went missing en route from Singapore to the Vietnamese port of Quang Tri, falling out of contact shortly after it left port a little more than a week ago. “The Sunrise and its 18 crew members were released early this morning by pirates who took around a third of cargo on board,” Vietnamese Maritime Department Director Nguyen Nhat said yesterday. “Around a dozen pirates with guns jumped on the ship, took control and beat the crew,” said Nhat, who had spoken to the ship’s captain, Nguyen Quoc Thang, early yesterday after their release. “The pirates broke the communication system, robbed the oil and goods on board,” he added. Southeast Asia has seen a spate of daring hijackings this year, centred on the Strait of Malacca running between Malaysia, Indonesia and Singapore. The incidents have fanned fears that the region’s busy shipping lanes—plagued by piracy for centuries—could once again become a problem area after an earlier surge in sea banditry was largely suppressed by regional navies. The Sunrise, which belongs to a shipbuilding company in the northern Vietnam port of Hai Phong, was carrying more than 5,200 tons of oil and 18 crew, state media reported. “Two crew members were slightly injured,” Nhat said, adding that the others were unhurt. 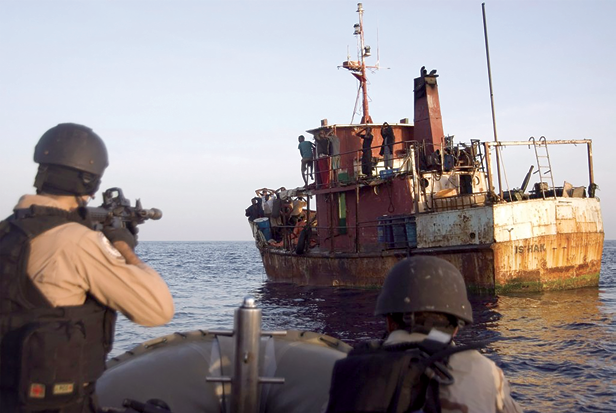 Southeast Asian piracy attacks have crept back up, according to the International Maritime Bureau. The agency in June called on regional authorities to step up cooperation to prevent a re-emergence of the piracy scourge in the Malacca Strait and adjacent waters — the conduit for one-third of global trade flows.